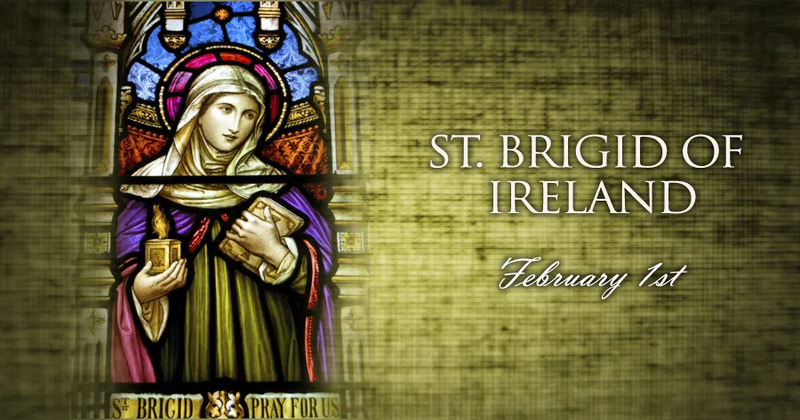 On Feb. 1 Catholics in Ireland and elsewhere will honor Saint Brigid of Kildare, a monastic foundress who is – together with Saint Patrick and Saint Columcille – one of the country’s three patron saints. St. Brigid directly influenced several other future saints of Ireland, and her many religious communities helped to secure the country's conversion from paganism to the Catholic faith. She is traditionally associated with the Cross of St. Brigid, a form of the cross made from reeds or straw that is placed in homes for blessing and protection. Some Eastern Catholics and Eastern Orthodox Christians also celebrate her feast, on the same date as the Roman Catholic Church. St. Brigid has been profiled many times by both ancient and modern writers, but it is notoriously hard to establish the historical details of her life, and the various accounts make many conflicting claims. According to one of the more credible biographies of Brigid – Hugh de Blacam's essay in “The Saints of Ireland,” on which the following account is based – most historians place her birth around the year 450, near the end of Saint Patrick's evangelistic mission. Brigid was born out of wedlock, the daughter of a pagan cheiftain named Dubthach and a Christian slave woman named Broicsech. The cheiftain sold the child's pregnant mother to a new master, but contracted for Brigid to be returned to him eventually. According to de Blacam, the child was probably baptized as an infant and raised as a Catholic by her mother. Thus, she was well-formed in the faith before leaving Broicsech's slave-quarters, at around age 10, to live with Dubthach and his wife. Within the new circumstances of the cheiftain's household, Brigid's faith found expression in feats of charity. From the abundance of her father's food and possessions, she gave generously to the poor. Dubthach became enraged, threatening to sell Brigid – who was not recognized as a full family member, but worked as a household servant – to the King of Leinster. But the Christian king understood Brigid's acts of charity and convinced Dubthach to grant his daughter her freedom. Released from servitude, Brigid was expected to marry. But she had other plans, which involved serving God in consecrated life. She even disfigured her own face, marring her beauty in order to dissuade suitors. Understanding he could not change her mind, Dubthach granted Brigid permission to pursue her plan, and material means by which to do so. Thus did a pagan nobleman, through this gift to his illegitimate daughter, play an unintentional but immense part in God's plan for Ireland. While consecrated religious life was part of the Irish Church before Brigid's time, it had not yet developed the systematic character seen in other parts of the Christian world by the fifth century. Among women, vows of celibacy were often lived out in an impromptu manner, in the circumstances of everyday life or with the aid of particular benefactors. Brigid, with an initial group of seven companions, is credited with organizing communal consecrated religious life for women in Ireland. Bishop Mel of Ardagh – St. Patrick's nephew, and later “St. Mel” – accepted Brigid's profession as a nun. According to tradition, the disfigurement she had inflicted on her face disappeared that day, and her beauty returned. St. Mel went on to serve as a mentor to the group during their time at Ardagh. Around the time of his death in 488, Brigid's community got an offer to resettle. Their destination is known today as Kildare (“Church of the Oak”), after the main monastery she founded there. Brigid's life as a nun was rooted in prayer, but it also involved substantial manual labor: clothmaking, dairy farming, and raising sheep. In Ireland, as in many other regions of the Christian world, this communal combination of work and prayer attracted vast numbers of people during the sixth century. Kildare, however, was unique as the only known Irish “double monastery”: it included a separately-housed men's community, led by the bishop Saint Conleth. From this main monastery, Brigid's movement branched out to encompass a large portion of Ireland. It is not clear just how large, but it is evident that Brigid traveled widely throughout the island, founding new houses and building up a uniquely Irish form of monasticism. When she was not traveling, many pilgrims – including prominent clergy, and some future saints – made their way to Kildare, seeking the advice of the abbess. Under Brigid's leadership, Kildare played a major role in the successful Christianization of Ireland. The abbess' influence was felt in the subsequent era of the Irish Church, a time when the country became known for its many monasteries and their intellectual achievements. St. Brigid of Kildare died around 525. She is said to have received the last sacraments from a priest, Saint Ninnidh, whose vocation she had encouraged. Veneration of Brigid grew in the centuries after her death, and spread outside of Ireland through the work of the country's monastic missionaries.